Head Coach, Mark Cornwell, later described this win as the biggest in his time at Hartpury as his side continued to fight hard at the foot of the Championship table. The Red and Blacks made the trip to a sunny Jersey for Round 18 of the Green King IPA Championship. Bristol duo, centre Charlie Powell and back-row forward Sam Graham, were welcomed back into the starting line-up, in what looked like a strong selection, despite the return to Gloucester of scrum-half, Ben Vellacott. Jersey did have an opportunity to edge ahead, but Brett Herron’s 45-metre kick bounced off the uprights, to the visitors’ relief, before another kickable attempt, from Aaron Penberthy, drifted wide. 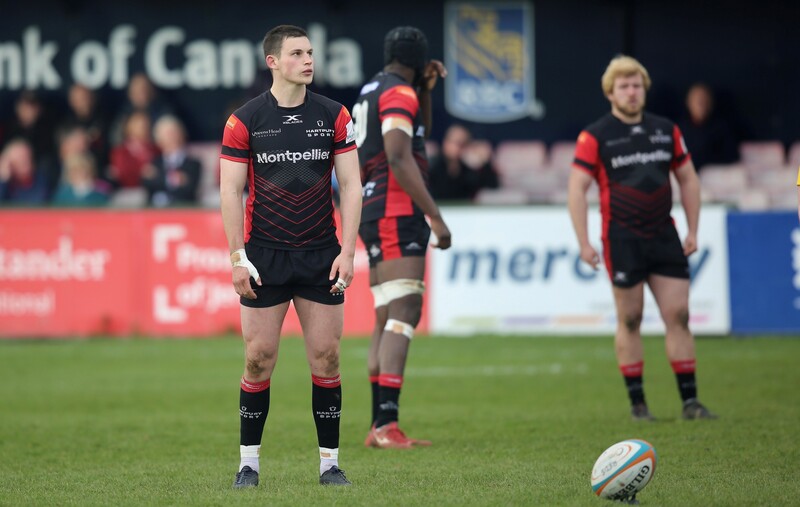 Hartpury were free to celebrate their third win in the last four matches, giving the club a real hope of avoiding a return to National League 1. However, Richmond also won, away at a fading Nottingham, meaning that Hartpury still have everything to do, in their remaining four games, to maintain their current status.